“Whether you agree or not, a sumptuous feast is central to all Christmas celebrations. So, here is a traditional dish that is a must to have while celebrating Christmas. 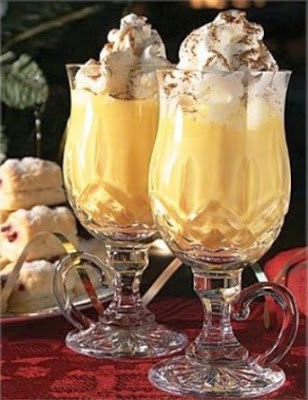 Try this easy to prepare Eggnog recipe and make this Christmas special. Sit with family and serve this delicious eggnog as a dessert.” Shaina G.
setting for about 4 minutes to bring the mixture to a slowly boil. Take a large bowl and combine egg yolks and sugar. Then, whisk hot milk mixture slowly in the eggs. Strain the mixture to remove cloves and let it cool for about an hour. Now, stir in rum, cream and 2 teaspoon vanilla along with nutmeg. Refrigerate it overnight before setting.